Big Game Camps is a radical idea which combines the thrill of a wildlife-camping experience with a comfy hotel experience. The meaning is simple. This is your safe way of camping. If you love to have a camping experience yet you want to do it with a finely supervised cuisine, comfortable beds and communication with civilization, Big Game Camping will be your answer! Whale, Big Tooth- the Sperm Whale, Big Cat- the leopard, Big Ele -the Asian Elephant and Big tropical Bear – Sloth Bear are the Sri Lankan big five and if you are lucky, you will be able to see three out of the five in your Big Game Camp time. 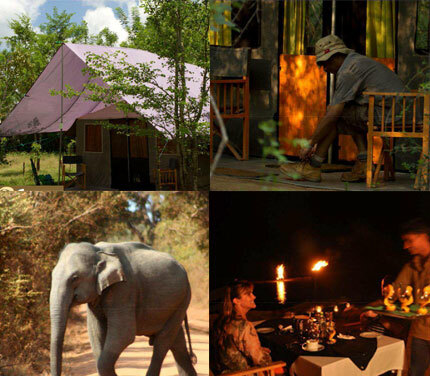 The Big Game Camps, camping sites are located in three Sri Lankan wildlife destinations; Yala, Wilpattu and Udawalawe. Every wildlife safari in Sri Lanka will have the same objective; to see the most of what the Park has to offer in the shortest amount of time. The Big game safari camp provides an experience that will give you just that. With Big game camps, you will have the option of setting up base on the borders of the Yala National Park itself, cutting down significantly on your travel time. The whole project is completed with semi-permanent structures and canvas tents which are removed and remodeled once in three months. The toiletry facilities are well provided with hot and cold water. The staff is hospitable and responsible, the safari team also remarkably resourceful and well experienced. With all those facts your camping experience will be comfortable and the wildlife safari expedition will be safe and enjoyable. The Camp site is carefully picked and an eager connoisseur can experience the bio-diversity even within the camp perimeters. There are mini wild walks and bird watching sessions organized within the camp but you can always lose your way into the wild and experience nature trails and safaris with a crew. Big Game Camps offers you set menus, which have an authentic tropical cuisine and more, yet they are always ready to please connoisseurs with their favorites. Hence, if there is a particular cuisine you want to taste, all you have to do is ask the chef! Considering all the tropical countries, Sri Lanka hails as a hallmark of tourism as she is such a beauty with serene vistas, pristine wilderness and unprecedented natural panoramas. Among thousands of activities one can experience in Sri Lanka, camping is one of the most exciting and maybe once in a lifetime pleasure experience as many travelers would state. Hence, again we remind you that the Big Game Camps offer you each and every experience you can have as a classic camper in a safe and comfortable way. That’s New Age camping if you ask me. And never forget, Nature is far more cheaper and effective than a therapist!